You click ‘Continue’ (and then immediately wish you had taken a backup of your database before you clicked that button, because that’s what good developers should do!) and Umbraco goes off and does some database bits and bobs behind the scenes before redirecting you back into Umbraco. Yeay it worked! You click around a bit, publish a few items here and there, and you’re now ready to deploy your updated Umbraco installation to your staging and production environments. But how can you trigger that database update process again because it’s already happened? There has to be a secret command or spell you can use to initiate it, but you can’t remember for the life of you what it is (and it’s actually quite difficult to find the answer from Google too!). The value in this case is the version that you just upgraded to. 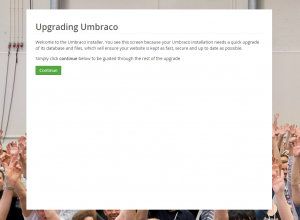 Deploy your Umbraco codebase to your staging or production environment, and you will see that same upgrade splash screen. Click the ‘Continue’ button, promise yourself that next time you really will take a database backup before clicking that button, and let Umbraco do it’s magic. Once the update is complete and you’re back in the Umbraco portal, look at the web.config file again and you will see the version number has been incremented back up to the current installed version. @MaffRigby Ps. We never do db upgrades on patch versions! Only on minors (7.2 to 7.3 for example). So effectively you only have to worry about triggering this database update when you do minor version upgrades, and you don’t have to worry about it at all after version 7.3! So what was the reason the post became obsolete after 7.3?